Erlanger Health System is getting closer to making the complete switch to Combined Heat & Power in Chattanooga. During the CHP Tour USA informational event held earlier this week, attendees were given insight into the innovative project and its progress as well as a site tour of Erlanger’s 8 MW CHP system. Ben Edgar, CEO of White Harvest Energy, helped make it all possible. His team has been serving as the developer and operator of the project and will continue some of those duties after completion. Working alongside 2G Energy, which supplied the CHP equipment, Edgar says the CHP system is expected to go live before the end of the year. 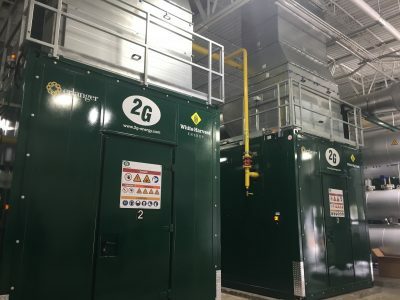 2G Energy Inc., a subsidiary of 2G Energy AG in Germany, is a CHP cogeneration specialist offering cogeneration systems in 50 to 2,000 kW power range. The company has over 5,000 systems installed worldwide, and its U.S. headquarters is located in St. Augustine, Florida. Unlike individually engineered CHP plants, 2G Energy’s modular systems make installation easier and incorporate components geared towards each other which made the construction phase of the project complete within a matter of months. Good news for Erlanger. But since Erlanger is an emergency care center that remains in operations 24 hours a day, 365 days a year, the optimal arrangement for their facility is four packaged, reciprocating-engine based CHP units rated at 2,000 kWe each, for a total of 8,000 kWe. During the presentation, Edgar explained each Heat Recovery Steam Generator is connected to two CHP units to optimize steam generation. The fourth engine is placed in standby and used when other engines are out for planned or unplanned maintenance. In this manner, at least one of the engines in the CHP system can be in operation 24/7/365 along with the hospital. John Loetscher, Vice President of Facilities, Engineering, and Construction at Erlanger cited cost savings and reliability as the leading factors that drove the hospital to make the decision to be powered by a CHP system. Incentives provided by TVA also made the project very economically attractive. As the icing on the cake, the CHP project is highly sustainable. Due to the increased efficiency of the system, there’s significant reductions in CO2 emissions. Once the system is turned on at Erlanger, it’ll be the equivalent of taking 4,000 cars off the road annually and has the carbon sequestering ability of 20,000 acres of forest. Edgar also pointed out that while Erlanger’s system is powered by natural gas, the 2G Energy technology is capable of using renewable gas so it would be 100% renewable energy. TVA has launched a new Integrated Resources Plan (IRP) that will inform the company’s next long-term financial plan and proactively address the changing utility marketplace. As with past IRPs, collaboration with customers and stakeholders is vital. The first opportunity for input into the IRP is a 60-day public scoping period starting February 15 and ending April 16, 2018. During that time, the public can provide input at the IRP website, www.tva.gov/irp; via an email to IRP@tva.gov; or by mail to addresses listed on the IRP website. February 27, 5:30 – 7 p.m. EST. Educational open house at the Westin, Chattanooga, TN. March 5, 5:30 – 7 p.m. CST. Educational open house, MLGW Auditorium, Memphis, TN. The purpose of the public scoping period is to ensure that a full range of issues and comprehensive portfolio of energy resources are addressed in the IRP. We encourage you to share your thoughts about important factors TVA should consider in developing the IRP. Volkswagen unveiled the I.D. concept family, a new line of electric vehicles, at the 2017 Los Angeles Auto Show and said it hopes to start producing EVs in the United States by 2023, pointing to its Chattanooga, Tennessee, plant as the location where it might happen. In October, the German automaker’s board approved a €34 billion investment in electric mobility and autonomous driving capabilities over the next five years. Its goal is to make a million electric cars a year by 2025 and become the world’s largest electric auto manufacturer. Starting with Volvo earlier this year (if we count out Tesla), several other brands have recently announced their commitment to an electrified future of mobility. At the LA Auto Show, Volkswagen introduced the new I.D. line of electric vehicles, including the Crozz and the Buzz, the former and SUV and the latter a redesign of the automaker’s famous 1960s minibus. Nissan manufacturing operations in Smyrna, Tennessee recently received the 2017 ENERGY STAR Partner of the Year – Sustained Excellence Award for the sixth year in a row. This is the highest honor given to top organizations dedicated to protecting the environment by making their operations more energy efficient. Nissan has been recognized by the U.S. Environmental Protection Agency for its continued commitment to reducing greenhouse gas emissions and improving energy management. Nissan’s efforts to reduce energy usage include switching to more efficient LED lighting, enhancing the compressed air leak production program, optimizing chilled water systems and using a paint process involving less volatile organic compounds that has cut energy usage by 30 percent. Nissan’s Tennessee facility was also recently awarded the ENERGY STAR Certification for the eleventh year in a row, signifying Nissan’s spot among the top 25 percent of the automotive manufacturing industry for superior energy management. 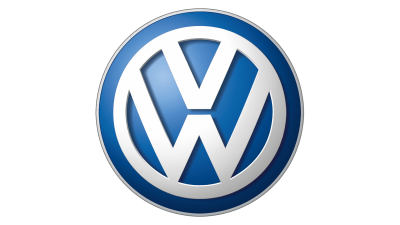 Also Volkswagen’s Chattanooga plant has been continuing to strengthen its energy policies. The Chattanooga facility is the first and only LEED Platinum certified automotive plant worldwide. The plant has a solar park with 33,000 solar panels on 66 acres with a capacity of 9.5 million watts. Volkswagen also utilizes an advanced painting process that reduces CO2 emissions by 20 percent, and power efficient light bulbs installed in various lighting systems on site saves an estimated 20 percent energy compared to conventional industrial lighting. Some of the nation’s most powerful thought leaders in energy innovation convened in Chattanooga late last month, including the Tennessee Advanced Energy Business Council. More than 150 attendees from universities, industry and federal agencies participated in the Southeast Regional Energy Innovation Workshop. The forum, designed to advance clean energy technology innovation in the region, was hosted by the University of Tennessee and Oak Ridge National Laboratory (ORNL) and provided an opportunity to explore ways universities, industries and national labs and other federal agencies can drive rapid innovation of technologies for use in the marketplace. 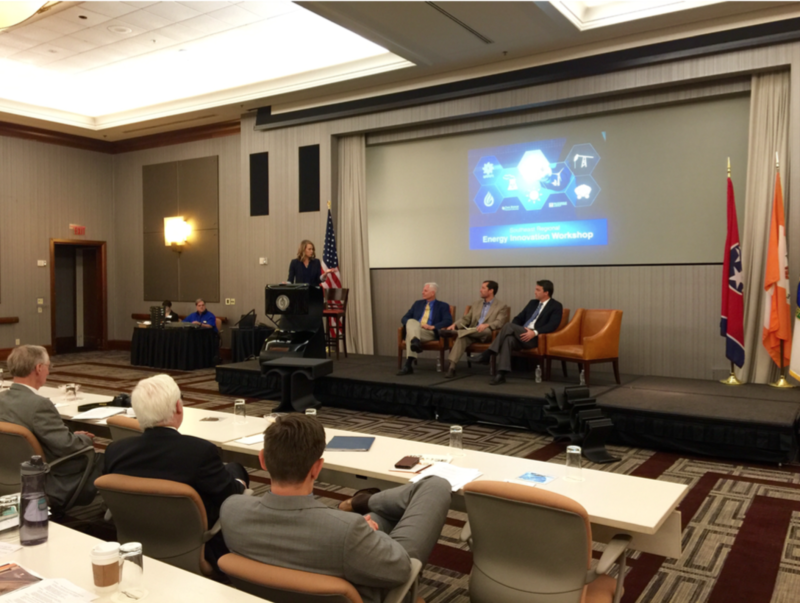 TAEBC hosted a panel discussion titled Clean Energy Innovations, moderated by TAEBC’s Cortney Piper. Other panelists included Tom King; ORNL; David Wade, COO, EPB; and Platt Boyd, CEO Branch Technology. The panel addressed such topics as how working with a national lab and regional universities can help solve problems by focusing on a key problem. • Agreeing on a clear objective and clear vision (all parties must agree on the overall goal and outcomes). Other topics covered during the panel included the existing and potential economic impact on the region from clean energy innovations and the most pressing clean energy question for the Southeast. Panelists agreed that resources, affordability and reliability remain the most pressing concerns for clean energy development. Participants referenced TAEBC’s Economic Impact Report, reinforcing the fact that Tennessee is well-positioned to become a national and international leader in the $1.3 trillion global advanced energy marketplace. Overall, the panel concluded that in order for clean energy innovation to continue to expand throughout the region, impact must be demonstrated and investment must be made on full scale deployments to show the impact of new innovations. In addition to workshops, ORNL announced during the forum that the national lab would be expanding to the Chattanooga area by opening a Downtown office. ORNL Director Thom Mason said that ORNL will continue to partner with EPB, a municipally-owned utility, on researching the performance, security, and efficiency of Chattanooga’s electrical system. This research can be applied to make power systems nationwide cleaner, safer and more efficient. The Southeast Energy Innovation Workshop further supports TAEBC’s mission of championing advanced energy development in the region, recognizing that the area is uniquely situated with its focus on advanced manufacturing for automotive, aerospace and wind; carbon fiber manufacturing; nuclear energy technology development; grid technology enhancements; microgrids, photovoltaics; materials by design; and energy storage. TAEBC appreciated the opportunity to lead a discussion during the forum and will continue to participate in similar workshops that support the mission of supporting advanced energy development as an economic driver in the region. To view photos from the event, click here. By joining TAEBC, you can be part of this exciting effort to grow Tennessee’s economy through advanced energy innovation, generation and manufacturing.